Background Molecular testing is increasingly needed in colorectal carcinoma (CRC) and the current clinically relevant mutations are in BRAF, KRAS and NRAS. This study aimed to further validate a new alternative polymerase chain reaction (PCR) platform (Idylla, Biocartis) against existing next-generation sequencing (NGS) and immunohistochemistry (IHC) assays. Methods 56 Idylla tests were performed on 43 CRC cases, in a total of 74 comparisons against an NGS panel (Ion Torrent) and the VE1 (anti-BRAF) antibody IHC. Discrepant cases were also compared with either conventional (Cobas) or droplet digital PCR (Bio-Rad). Results Idylla showed an overall concordance of 100% (95% CI 93% to 100%) with comparator molecular testing and indications were that Idylla is likely to be more sensitive than routine NGS. BRAF IHC showed 90% concordance with NGS (95% CI 70% to 97%). Conclusions This study validates Idylla in formalin-fixed, paraffin-embedded CRC tissue. BRAF IHC, however, is an unreliable substitute for molecular testing in CRC. The real-time PCR-based Idylla platform offers a fully automated, fast and potentially cost-effective technology for molecular testing in CRC. The technology is based on a disposable cartridge format and carries out testing with all reagents on board. The test requires the user to insert rolled sections of fixed tissue into an assay cartridge with results available within a few hours, as described previously.14 ,15 The Idylla assays are based on one of two methodologies as detailed in table 1. The first of these is a conventional TaqMan reporter system (the Idylla BRAF Mutation Test). The second is a novel chemistry known as PlexPCR and is used for both the Idlla KRAS Mutation Test and the Idylla multiplexed NRAS-BRAF-EGFRS492R Mutation Assay, the focus of this study. This system uses primers (PlexPrime) that create amplicons containing a small region with a sequence different from that of target DNA. This works together with a specific amplicon sequence-matched reporter probe (PlexZyme) and this significantly increases the overall detection specificity and allows multiplexing of numerous gene targets in one assay.16 ,17 The Idylla system then can detect a broader range of mutations within KRAS, NRAS and BRAF than many currently available commercial PCR platforms.18–20 We previously reported the validation of the Idylla BRAF Mutation Test15 and the Idylla KRAS Mutation Test21 and the aim of this study was to extend the evaluation of Idylla to NRAS testing and validate all three targets together with NGS and available IHC. CRC cases, which had previously undergone targeted NGS with the Ion AmpliSeq Cancer Hotspot Panel version 2 (v2) (Thermo Fisher Scientific), were taken from the departmental archive at the John Radcliffe Hospital. Where possible, sample sizes (20 cases; equal numbers of positive and negative cases by NGS) for each validation were selected in line with recommendations.22 In some cases, limited material was available for testing, for example, only 5 mutated NRAS cases were identified in the archive and therefore 5 positive and 13 negative (only 18 cartridges were available) were used. Both Idylla assays were validated against the Ion AmpliSeq Cancer Hotspot Panel v2, which includes BRAF, KRAS and NRAS coverage. The manufacturer quotes an assay detection rate of 98% for mutations with at least a 5% variant frequency where the coverage is 1000×–4000×; details are given in table 1. This was run on the Ion Torrent Personal Genome Machine (PMG) platform (Thermo Fisher Scientific); for Ion Torrent testing, a tissue area of up to 250 mm2 on up to eight sections at a maximum thickness of 10 µm was used. A minimum of 30% tumour was required for the assay.23 ,24 In all cases, the same FFPE tissue block was used for Idylla and Ion Torrent testing and the same tumour area was macrodissected for processing. The NRAS-BRAF-EGFRS492R Mutation Assay was run on a cohort of 18 cases and compared with NGS. Thirteen cases from this cohort and a five further separate cases (18 in total) also underwent testing with the KRAS Mutation Test. Discrepant cases were further tested where needed with droplet digital PCR (QX100 Droplet Digital PCR System Droplet Generator, Bio-Rad Laboratories), as described previously.15 Idylla EGFR results were not evaluated. A statistical analysis of concordance, sensitivity and specificity was carried out using conventional formulae in Microsoft Excel. Fifty-six Idylla test cartridges were run on 43 tumours, undertaking 74 test comparisons. Twenty-three cases were selected for comparison with Ion Torrent, 18 of these were tested with the NRAS-BRAF-EGFRS492R Mutation Assay and 18 were tested with the KRAS Mutation Test. The raw data are given in table 2. One cartridge failed (an NRAS-BRAF-EGFRS492R Mutation Assay) due to a software error; this brought the total number of comparisons down to 72. The comparison results and statistical analysis are summarised in table 3. Overall, there was concordance between Idylla and routine tests (NGS and IHC) for 69/72 comparison tests, making the concordance 96% (95% CI 88% to 99%), with only three discordant results. There was 100% (95% CI 82% to 100%) concordance between Idylla and Ion Torrent for detecting BRAF and KRAS mutations. The concordance between Idylla and Ion Torrent for NRAS was lower at 94% (95% CI 73% to 99%) due to one discordant case which appeared mutated on the Idylla assay (Q61L), but wild type by Ion Torrent. This case was further tested by droplet digital polymerase chain reaction (ddPCR) and this confirmed a Q61L mutation in NRAS at 1.36–1.47%. Given this, the Idylla was 100% (95% CI 82% to 100%) concordant for NRAS detection when compared with established molecular techniques (Ion Torrent and ddPCR). The overall concordance between Idylla and established molecular tests (Ion Torrent/ddPCR) combined was 100% (93–100%) for BRAF, KRAS and NRAS. The concordance between BRAF IHC and Idylla was lower at 90% (95% CI 70% to 97%) due to two discordant cases with apparent IHC-detected V600E mutations that appeared wild type on Idylla testing. 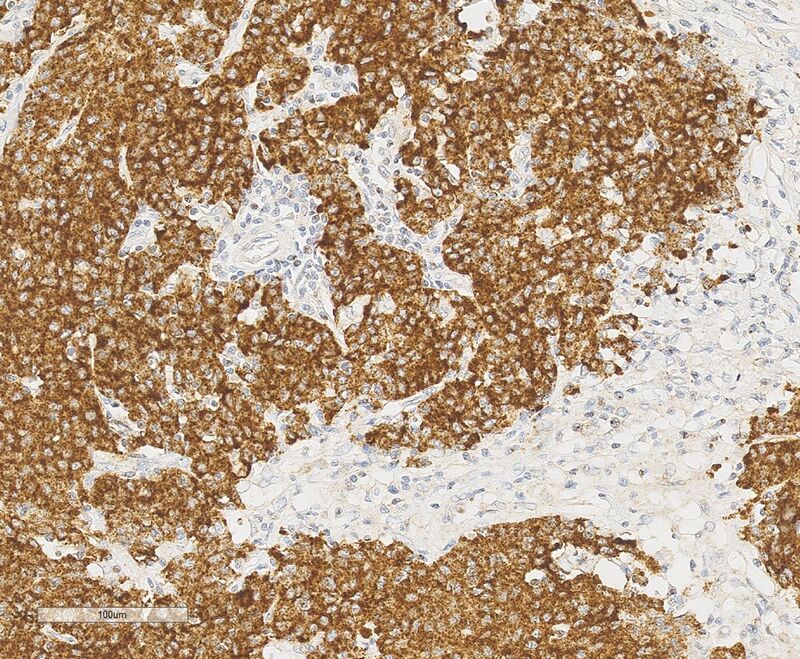 We know from our previous study that the BRAF V600E Idylla results for these cases were concordant with Cobas PCR,15 indicating false-positive IHC staining. The scorers agreed in 17 of the 20 cases making the kappa value 0.7. Although this study did not follow the design of a diagnostic accuracy study, it gives a useful indication of the likely sensitivity and specificity of Idylla in this context. This is especially relevant for NRAS testing, for which a reliable commercial PCR-based test for use in CRC management is less established and for which NGS is being increasingly requested in clinical practice. A larger follow-up study for NRAS testing is needed to confirm this, however. An important issue is the financial implications of using the Idylla system. The cost in our institution of Ion Torrent NGS is £300 per case, whereas the use of the KRAS and BRAF/NRAS Idylla cartridges in combination to cover all three actionable gene targets in CRC would cost around £400. Therefore, a move to using Idylla in an established molecular diagnostics laboratory may not be cost-effective. However, for institutions with no easy access to molecular testing, the fast turnaround times coupled with potential subscription models (no upfront cost) for Idylla use may be attractive. Colorectal adenocarcinoma with BRAF V600E mutation, demonstrated by the AmpliSeq next-generation sequencing (NGS) panel and COBAS PCR, immunostained with mouse monoclonal antibody VE1 (anti-BRAF V600E mutation-specific antibody, Ventana Medical Systems). This demonstrates positive staining with an intensity score of 3 and a tumour percentage score of 2. No EGFR mutations were detected by any of the testing modalities in this study. As there is currently no reliable comparison test for the S492R codon change commercially available we did not attempt to validate the Idylla for this target. Targeted mutation testing is becoming routine in colorectal carcinoma. BRAF, KRAS and NRAS are the most clinically useful targets. The need for specialist staff, techniques and equipment are barriers to universal NHS testing. Automated PCR with the Idylla System offers simple, fast and cost-effective molecular testing which could be used on-site in any histopathology department in the UK. The Idylla is accurate for detecting BRAF, KRAS and NRAS mutations in colorectal FFPE tissue. The Idylla system was kindly loaned by Biocartis. Biocartis contributed some test cartridges. The authors thank the Oxford Molecular Diagnostics Centre for providing clinical results with conventional PCR and NGS. Royal College of Pathologists. Standards and datasets for reporting cancers: dataset for colorectal cancer histopathology reports. Royal College of Pathologists, 2014.
. Multi-Center Evaluation of the Fully Automated PCR-Based Idylla KRAS Mutation Assay for Rapid KRAS Mutation Status Determination on Formalin-Fixed Paraffin-Embedded Tissue of Human Colorectal Cancer. PLoS ONE 2016;11(9):e0163444.
. A scoring system for immunohistochemical staining: consensus report of the task force for basic research of the EORTC-GCCG. European Organization for Research and Treatment of Cancer-Gynaecological Cancer Cooperative Group. J Clin Pathol 1997;50:801–4. Contributors RC devised the project and carried out the Idylla testing. All authors contributed to the final manuscript. Funding Consumables, tissue handling costs and additional test cartridges were funded by the Oxfordshire Health Services Research Committee (Fund 8262 to RC/ES). Ethics approval The National Research and Ethics Service (Oxfordshire Research and Ethics Committee A; reference 04/Q1604/21).